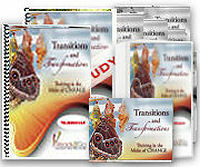 Speech: Transitions and Transformations - Thriving in the Midst of Change from Ready2Go Marketing Solutions, Inc. This presentation is designed to share insights about understanding and thriving during change. Change is a universal topic and although many people understand that change is normal, very few of us have an understanding of the process. Your group will walk away with a better awareness of how change impacts their lives. They will learn strategies that will help them not just to survive change, but how to thrive in spite of the change. They will understand the change response and recognize that many of their initial reactions to change are normal. Most importantly, participants will walk away with a new understanding of change and how they can adapt their behavior to thrive during the midst of change.